Xavi Hernandez has been playing for La Liga's Barcelona since he was 11 years old. That is when he recieved his first pay check of 24 euros. Xavi spent that money on a toaster for his mother. He is a family man and to this day he still lives with his parents, brother, sister and Grandma. His father says Xavi has never been interested in money as he has been offered several million of dollars from other teams but wants to stay in Barcelona. He was nominated for the Ballon d'Or alongside with Andres Iniesta and Lionel Messi. 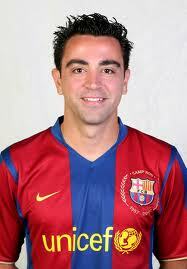 Xavi has won the 2010 Worlds Soccer Player of the Year as last year was won by Lionel Messi. Xavi plays for his national team Spain and lead them to be the 2010 World Cup Champions. Xavi has won everything you can name. He is known for his stylish playmaking ability and orchestrating the midfield. The weaknesses of Xavi are only his height and strength. But with his quickness and capability of precision passing his weaknesses are immediately erased. Since his quickness is a strong point and in his 2010-2011 season he has suffered 45 fouls. From ESPN, a quote that describes Xavi, "Xavi is a player who has the Barcelona DNA: someone who has the taste for good football, someone who is humble and someone who has loyalty to this club. From the first moment I saw him play, I knew he would become the brain behind Barcelona for many years to come. He plays very, very well& much better than I ever played even when I was at my best." Pep Guardiola, September 2008.